Thanks, Rosemary! I love his artwork. Would love to have even one of his Christmas cards. Maybe we should cultivate a friend in Sweden. :-) Do you suppose he has anything available as a print? I look forward every day to your emails and posts on Instagram! This one was especially wonderful. Thanks!! Love it! Thanks for introducing us to another great illustrator. justaweecatnap -- You know I will! I am happy to share new illustrators when I find them. So glad you like this one. SALLY -- Thanks. I knew this illustrator would be a big hit on my blog. JudyMac -- I looked and looked but he doesn't have a website. Since he was born in 1940, maybe he is not fond of technology. 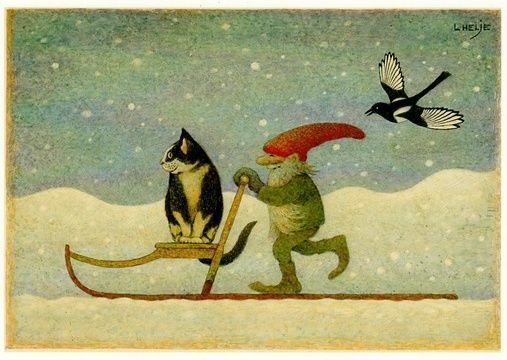 If you google his name and the word prints many Etsy and Ebay sellers have old postcards for sale and many of the sellers live in Sweden. I am surprised he hasn't gone commercial. Wouldn't a calendar be wonderful? annette -- Maybe the artist will see this request and make one. I would love a calendar with his seasonal images. Everything about this is pure delight - the work of a playful artist. Linda -- I couldn't agree more. I love his playful spirit too. An Etsy search was fruitful ..... search “Helje” and “Arabia of Finland” for a Christmas plate. JudyMac -- Judy, How nice! I'm glad you found something you wanted. Didn’t necessarily want, just looking to see what’s out there. The plate was lovely though. Love the search, like digging at an estate sale. With a grandson who has been living in Sweden for the past 19 months this truly touched my heart. I confess, I swiped it and will probably make a card to send to him. Thank my dear for always surprising us with the most charming and delightful things.